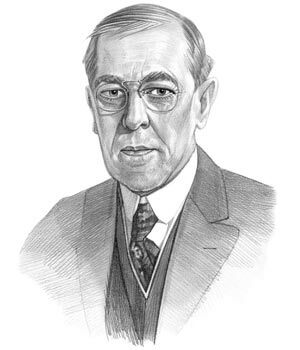 The other main events during the presidency of Woodrow Wilson are provided in the article on President Woodrow Wilson. The accomplishments of Woodrow Wilson and the most famous events during his presidency that concerned the events in the United States during World War 1 are provided in an interesting, short summary format detailed below. Summary of the Outbreak and Causes of World War 1: The Outbreak and Causes of World War 1 were complex. World War I was triggered on 28 June 1914 by the assassination of the Archduke Franz Ferdinand of Austria by a Serbian terrorist group and the countries of Europe responded according to their allegiances and treaties with other nations. President Woodrow Wilson adopted a neutral stance in an effort to keep the US from being drawn into a European war. Summary of the American Entry into World War 1: The American Entry into World War 1 began following over two years of neutrality. The causes for the American Entry into World War 1 included the sinking of the Lusitania passenger ship by a German U-Boat. and the Zimmermann telegram. With the consent of Congress, President Wilson made a declaration of war against Germany. on April 6, 1917. Summary of the Sussex Pledge: The Sussex Pledge was a promise made to the United States on May 4th 1916 to alter the German policy of unrestricted submarine warfare against non-military ships during World War 1. Germany went back on its promises of the Sussex Pledge on February 1, 1917 and German U-Boats began to attack American ships in the North Atlantic. Summary of the Sinking of the Lusitania: The Sinking of the Lusitania passenger liner on 7 May, 1915 by a German U-Boat (submarine) was soon followed by the sinking of six American merchant ships by German U-boats without warning. The sinking of the Lusitania led to the deaths of 148 American citizens and drew the nation into the war on the side of the Allies against Germany. Summary of the Black Tom Explosion: The Black Tom Explosion was an act of German sabotage on July 30, 1916 in New York Harbor during World War 1. The explosion occurred in a major munitions depot on Black Tom Island, between New Jersey and Liberty Island. Summary of the 1916 National Defense Act: The 1916 National Defense Act was passed by Woodrow Wilson to provide major restructuring of the U.S. Army prior to US entry into World War 1. Summary of the Zimmermann Telegram: The Zimmermann Telegram was a top secret, coded message sent on on 16 January, 1917 by German Foreign Minister Arthur Zimmerman to his Germany’s diplomatic delegation in Mexico. The Zimmermann Telegram promised the Mexican Government that Germany would help Mexico recover the territory it had ceded to the USA (New Mexico, Texas and Arizona) following the Mexican-American War. The US Facts about World War 1 including facts about the American Expeditionary Forces (AEF), Trench Warfare, the use of tear gas and mustard gas, the new strategies of tank warfare Aerial Warfare and the WW1 pilot's Dogfights, the weapons used and the number of US troops deployed in World War 1. Summary of America in World War 1: Woodrow Wilson led America in World War 1 which included the build up of the military, organizing industries and war production, raising money to support the war effort, mobilizing the workforce and passing new legislation to curtail antiwar activities, espionage and enemies on the home front. Summary of the 1917 Selective Service Act: The 1917 Selective Service Act was passed by Woodrow Wilson on May 18, 1917 requiring all men between the ages of 21 and 30 to register with local draft boards for conscription by national lottery. Summary of the US Battles in World War 1: The The most famous US Battles in World War 1 were the Battle of Cantigny, Battle of Cambrai, the Battle of Belleau Wood, the Battle of Lys, the Battle of St. Mihiel, the Somme Defensive, the Somme Offensive and the Battle of the Argonne Forest. Summary of the Espionage and Sedition Acts: The Espionage and Sedition Acts were passed by President Woodrow Wilson making it illegal to write, or speak, anything critical of US involvement in the war. Summary of the War Industries Board: The War Industries Board - WIB was established by Woodrow Wilson as a new Government Agency to regulate the economy and industries during World War 1. Summary of the World War 1 Mobilization: The World War 1 Mobilization ensured that supplies and troops were assembled in preparation for World War 1. New Federal agencies were created to regulate the economy and ensure the efficient use of national resources in order to further the war effort. Summary of the Harlem Hellfighters: The Harlem Hellfighters was the nickname of the all-black 369th Infantry regiment who bravely fought on the front lines and received the French Croix de Guerre. Summary of the World War 1 Liberty Bonds: The World War 1 Liberty Bonds were introduced by the government of Woodrow Wilson to raise money to help finance World War 1. Liberty Bonds were purchased by Americans, loaning the government money. The federal government agreed to repay the money loaned via Liberty Bonds, plus interest, in a specified number of years. Summary of the Committee on Public Information (CPI): The Committee on Public Information (CPI) specialized in the use of propaganda techniques in World War 1. The Committee on Public Information (CPI) used in many different forms of propaganda during World War 1 such as posters, magazines, billboards, movies, photographs, daily press releases and public speakers called the "Four Minute Men" in order to shape public opinion to build support for the war. Summary of the Fourteen Points: The Fourteen Points speech was made to Congress on January 8, 1918 by President Woodrow Wilson containing 14 points for a peaceful settlement of World War 1. Summary of the 1919 Treaty of Versailles: The 1919 Treaty of Versailles was signed after the Great War punishing Germany for the cost and damages of the conflict. Summary of the Armistice - End of World War 1: The Armistice - End of World War 1 in which the cessation of hostilities were celebrated on the eleventh hour of the eleventh day of the eleventh month on November 11, 1918. The Impact and Effects of World War 1 on America was wide ranging including the increase in manufacturing, production and efficiency which resulted in the US being respected as a world industrial leader. The US economy boomed, profits increased and led to a massive rise in consumerism for the wealthy in the period in US history called the Roaring Twenties. On the negative side, inflation was high workers were laid off and 1919 saw a massive wave of strikes, racial unrest and race riots breeding hatred and suspicion which spilled over into the Red Scare and the fear of communism. The introduction of Prohibition led to the rise of organized crime, gangsters, speakeasies and massive political corruption. Summary of the 1918 Spanish Flu Pandemic: The 1918 Spanish Flu Pandemic was a highly contagious, lethal virus that resulted in the deaths of almost 3 times more people than the 17 million soldiers and civilians killed during World War 1. Spanish flu afflicted over 25% of the U.S. population and 675,000 Americans died during the pandemic. The article on the he US and World War 1 provides an overview and summary of some of the most important events in the presidency of Woodrow Wilson during World War 1. The following Woodrow Wilson video will give you additional important history, facts and dates about the foreign and domestic political events of his administration.